Integrates the modeling and code generation features of RISE into the Visual Studio IDE. RISE is a modeling tool and code machine available inside Visual Studio. It allows you to graphically create a system model as part of your Visual Studio project and to transform this model directly into source code and database scripts. The output is plain versatile source code for the platform of your choice. The RISE suite consists of the Visual Studio extension, the RISE Editor modeling tool and a set of code generators for various targets. To bring it to use, place a RISE model – it’s an XML file - in your Visual Studio project; right-click to launch RISE to design or modify your system model, to generate code into your project or to incrementally update related databases. RISE Visual Modeling Visual Studio extension is a full (14 days) trial version. Once you’ve got RISE installed, you could check out our comprehensive CMS example. It’s a complete ready-to-run Visual Studio solution with model, source code and web clients. It illustrates how to use RISE, how to implement a SOA backend and how to build RIA frontends. 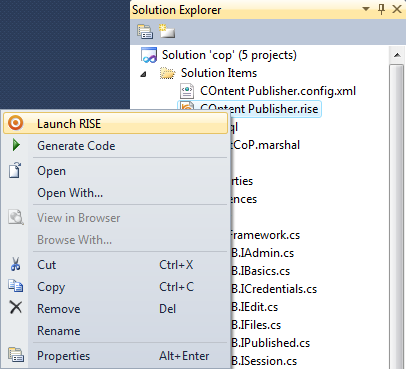 You’ll find an introduction to RISE and its Visual Studio extension in this document. For further info, resources and downloads please visit ourRISE Resource Center. The actual modeling takes place in the RISE Editor; a free standalone application deployed using the Microsoft Click Once technology. You and your development team can work together producing your information system models during the development life cycle. You do not need to have the RISE Editor installed on your Visual Studio machine in order to use the RISE Visual Modeling Extension. You will be able to generate the code into your Visual Studio solution, even if the RISE model was created somewhere else. However, if you want to be able to launch RISE from within the Visual Studio IDE to work with your model, you will need to install the RISE Editor. Right click on your model in your solution and select Launch RISE. The RISE user experience is based on a project concept, similar to that of most integrated development environments. The user works with resources and drawings that are part of a single development project. New objects can be dragged on to the current drawing from the object toolbar or be created from the menu bar. To modify an existing object the user either selects it in the project tree or clicks on it in the currently displayed drawing. RISE supports graphic editing of complex objects such as views and orchestrated methods. This is done by allowing the user to select objects and combine them. RISE automatically safeguards the combination process, thus, assuring a technically correct result. RISE provides code generators for the database layer as well as for the server side application layer (web services and persistent classes). 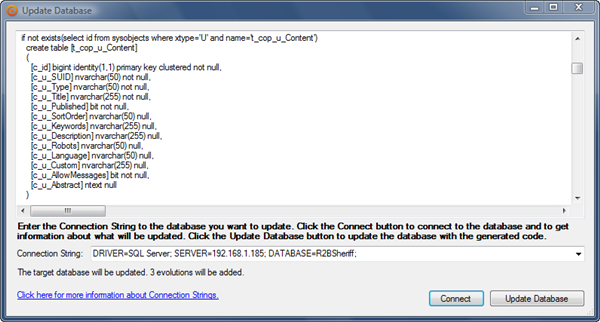 All database scripts are incremental allowing you to install and maintain any number of databases from a single model. from Visual Studio using RISE Visual Modeling. 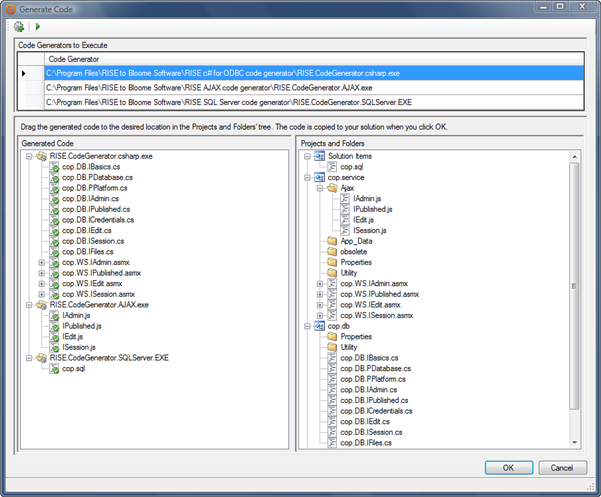 as an integrated part of the RISE Editor. using a script or from command line. RISE Visual Modeling allows you to configure any number of RISE Code Generators to execute on demand and automatically update your visual studio solution with the generated code. Right click on your RISE model in your Solution Explorer and select Generate Code. The Generate Code form contains a list of the Code Generators to execute, a tree view displaying the generated code and a tree view containing all projects and folders of your solution. Add the Code Generators of your choice. In our example we want to generate code using three different code generators, theSQL Server Code Generator for the database layer, the C# Code Generator for the application layer and the AJAX Code Generator for the Graphical User Interface in our Rich Internet Application. You can browse to find your code generators, e.g. if your code generators are installed on a shared network drive. All Code Generators installed on your local machine, as well as all Code Generators previously used by you, are available in the drop down list. 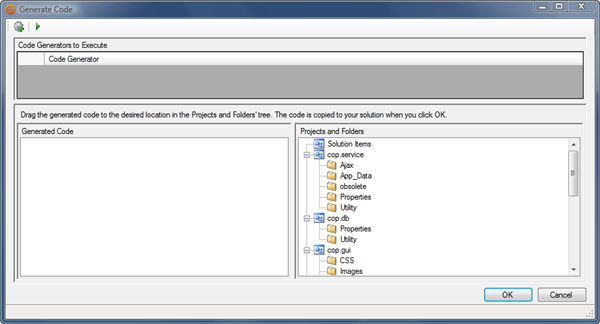 You add the generated code to your solution by dragging the respective nodes to the desired location in the Projects and Folders’ tree. In our example solution we have one project, cop.service, for our web services and Ajax code and one project, cop.db, for our persistent database classes. We have added the incremental database script to our Solution Items. The generated database scripts may of course be executed using the query tool for the respective database, e.g. a database script for SQL Server may be executed using the SQL Server Enterprise manager. However, a database script generated by a RISE Code Generator can also be used to update your database from within Visual Studio. 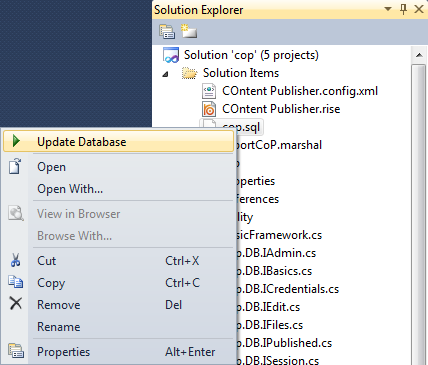 Right click on the script file in your Solution Explorer and select Update Database. A form containing your generated code will appear. The first time you update a database using the script, you must specify the connection string to your database. Click on the Connect button to connect to the database. Information about the state of your database model is displayed. The database code generators write incremental scripts for creating, and updating, relational database models based on the RISE model. A RISE model contains, unless it's been refactored, the entire life-cycle of the data model. The code generator translates this life-cycle into an incremental database specific script. This means that RISE allows you to continue working on your production system models, generate code, and update the databases incrementally without losing any data. In this example we are updating an existing database with three model evolutions. 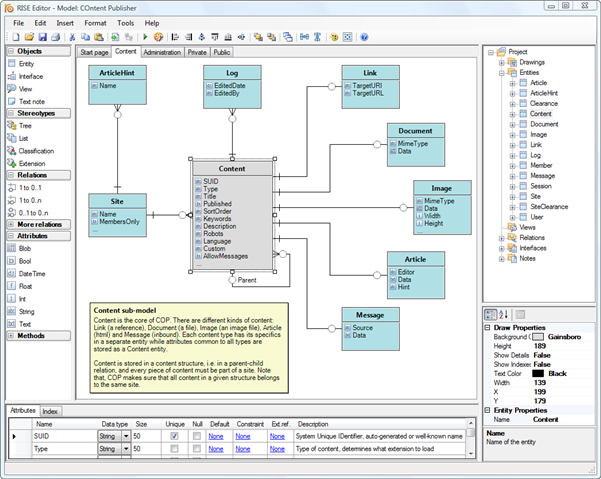 RISE is a software suite for Information System Engineering. It's a tool for model driven system development, packed with features and functions needed to build your information model and to turn it into a complete information management solution. It bridges communication barriers and covers the entire development chain from idea to maintenance.